All objects and surfaces with a temperature above absolute zero (minus 273oC) emit thermal radiation. Thermal radiation is similar to visible light, but typically at infrared wavelengths that the eye cannot detect. Infrared cameras convert thermal radiation into a visible light (thermal image) picture. Thermal imaging is a non-invasive, non-contact testing method that can be used to detect a broad range of building, mechanical and electrical issues before they become otherwise apparent. Thermal imaging is also used for a large and growing number of other applications including medicine, health screening, security, surveillance, agriculture and irrigation. BENSS’ Thermographers are internationally accredited certified by the ITC in Sweden, and can provide a full range of thermal imaging services. 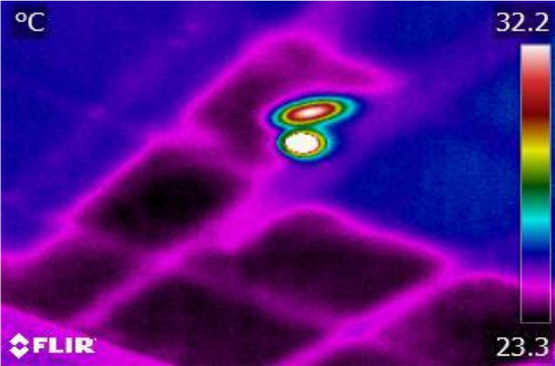 BENSS provides Building Envelope (Thermal Imaging) Surveys for all commercial, industrial and residential constructions. Our Thermographers image internal and external building surfaces, including ceilings, walls, floors, roof surfaces, windows, doors and access hatches. A typical survey, planned and conducted by an experienced thermographer, can identify a number of previously unrecognized issues including heat loss, air leaks, location of insulation (e.g. no insulation or insulation presenting a fire risk), water ingress, leaking door or window seals, rising damp, or structural damage. Where issues have already become apparent, thermal imaging can help identify the source and extent of a problem. Thermal Imaging can also be used for Mould Surveys. Image : Office ceiling showing uninsulated areas (black) and insulation (blue) too close to halogen downlight. Many of our clients own or operate larger commercial or industrial sites with significant pipework systems and connected tanks. BENSS Thermographers can typically identify and report on a range of issues. Image: Leak to chilled water pipe (black), below metal cladding and insulation. Mechanical or electrical breakdowns can lead to significant lost production time and repair costs, personal injury, or environmental damage. 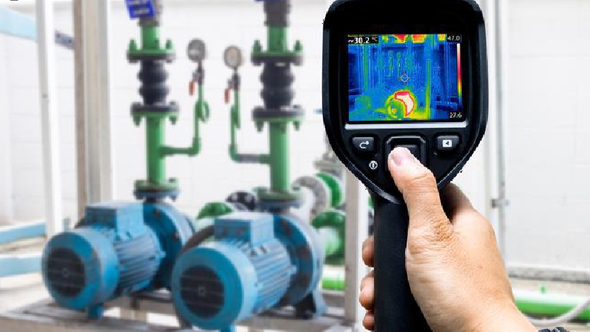 BENSS provides thermal imaging of operational plant, equipment and machinery and can often detect a number of potential mechanical problems, including overheating bearings, impact zones, friction or uneven wear to drive belts, or leaking gaskets or seals. Surveys of electrical boards and connections can detect components that are overheating or not functioning, or wiring defects and their location. Image: Overheating bearings to pump motor.